D. Robert Pease has been interested in creating worlds since childhood. From building in the sandbox behind his house, to drawing fantastical worlds with paper and pencil, there has hardly been a time he hasn't been off on some adventure in his mind, to the dismay of parents and teachers alike. Also, since the moment he could read, books have consumed vast swaths of his life. From The Mouse and the Motorcycle, to The Lord of the Rings, worlds just beyond reality have called to him like Homer's Sirens. It's not surprising then he chose to write stories of his own. Each filled with worlds just beyond reach, but close enough we can all catch a glimpse of ourselves in the characters. "Noah Zarc: Mammoth Trouble" by D. Robert Pease is a delightful read. Preteens and young teens will love the plot. So will adults. With a play on words and clever imagery, Pease has created a tale loosely based on Noah’s Ark. This is the author’s first novel; a sequel is due out later this year. The title is Cataclysm. I hope to be the first to write a review of the book. In this futuristic tale our main character is Noah. Noah is a twelve year old boy with disabilities. He and his family live on a space ship that collects animals from Earth’s past for the purpose of restocking the Earth. Noah is an excellent pilot due in part to his being a paraplegic. He spends most of his time in a special wheelchair called a Magchair. There is an implant that allows him to mental control the chair and the ship. On a mission to Earth during the Ice Age his mother is kidnapped by Hoan and his father is left stranded on the icy planet. It is up to Noah, Sam and Hamilton to save the day. In the midst of rescuing their father a Wooly Mammoth causes more than a little trouble. When Noah discovers a secret he reacts the way most boys his age would. This tale has several mighty messages in it: 1)	Man is destroying Earth; 2) We should never allow our disabilities to define who we are or what we can accomplish. 3) We write our own script; it doesn't matter where we came from but where we are going. The Zarc’s are charming characters, likeable and believable. When Hamilton explained time and space jumping or time travel I was reminded of "A Wrinkle In Time" by Madelyn L’Engle. She used a similar explanation for time travel, called a Tesseract Concept. I have been hooked on good sci fi since I read "A Wrinkle In Time" in the sixth grade. 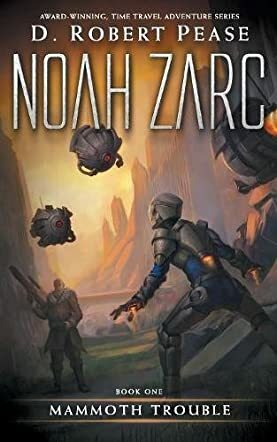 Noah Zarc is very good sci fi. It is refreshing to read a book of this quality. The author writes with the quality of a seasoned writer. I look forward to reading more of this author’s works.